Schnees has specialized in outdoor apparel, high performance boots and footwear, and camping and hunting gear for more than 100 years in Bozeman, Montana, in the heart of the beautiful Rocky Mountains. Schnee's Performance Boots - Every pair of boots here are destined to perform flawlessly, whether you are hiking steep hills, hunting in the wilderness or trekking to your next campsite. 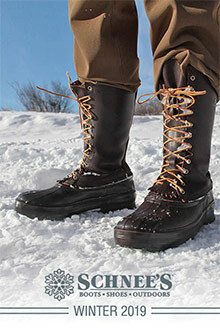 You will find a huge selection of Schnees catalog Pac Boots made in Montana, as well as Mountain, Africa and Upland Boots. Boots and outdoor footwear here last years, and have lived, hunted and traveled with their loyal customers from the North West Territories and the Yukon to the deserts of Mexico. Men's and Big and Tall Clothing - For casual, rugged good looks, men know that shirts, vests, pants - everything from the base layer to protective outerwear - this is the place to find the look and fit you need for comfort and performance. They have ranch wear, outdoor clothing and hunting apparel in the styles outdoorsmen expect. Find the Rifleman plaid, button down tartan shirt, flannels, high country jeans, Buffalo wood pants and Bugstopper pants for your recreational wardrobe. Women's Active wear - Whether you are looking for Western style with a fashionable twist, city shoes or hardworking trail shoes, Schnees has it. They have fashions for the trail, with sturdy shoes and insulated hiking boots, as well as fun accessories, scarves and hats. Hunting, Camping and Fishing Gear - Camping gear, camping backpacks and tents here are made to go the distance. For outdoor adventuring, choose Western Mountaineering sleeping bags, as well as the headlamps, Jetboil stoves, hand tools, axes, and medical emergency kits that are essential for your comfort and safety. Save money on rugged name brand footwear and adventure gear with the Schnees catalog coupon code for serious outdoors people.